Drivers can now have the best of both worlds with the 2018 INFINITI Q70 Hybrid—power and efficiency. Discover the top three reasons we’re raving about the Q70 Hybrid! 1. The Direct Response – The INFINITI Direct Response Hybrid carries a one-motor, two-clutch parallel hybrid system. The V6 engine and electric motor provide optimum efficiency and response time. 2. Innovative Technology – The steering and braking technologies in the INFINITI Q70 have been designed to deliver both environmental benefits and a natural driving feel. Plus, the Hybrid Electric Power Steering feature offers on-demand assistance through its electro-hydraulic system. 3. The Overall Design – The INFINITI Q70 Hybrid has a sporty yet elegant design. The exterior of the sedan is dramatic and luxurious. Plus, it is available to customers in a total of seven different eye-catching colors: Hagane Blue, Hermosa Blue, Chestnut Bronze, Liquid Platinum, Graphite Shadow, Black Obsidian and Majestic White. Looking forward to exploring the INFINITI Q70 Hybrid yourself? 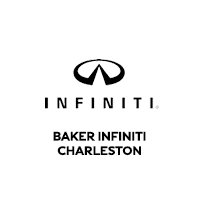 We encourage you to visit us at Baker Motor Company in West Ashley today.